Complex Regional Pain Syndrome, also known as Reflex Sympathetic Dystrophy (RSD), is a chronic pain syndrome characterized by severe and relentless pain. It is two to three times more frequent in females than in males. RSD is a malfunction of part of the nervous system. Nerves misfire and send a constant pain signal to the brain. 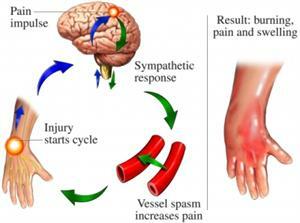 Therefore, a person with RSD may have a minor injury, like a sprain, but still experience intense pain. Early and accurate diagnosis and appropriate treatment are key to recovery. Symptoms include persistent moderate to severe pain, swelling, abnormal skin color changes, change in skin temperature, sweating, and limited range of movement. There are three stages to RSD. The acute stage occurs over the first three months. A few symptoms are burning pain, increased hair and nail growth in the affected region, joint pain, and color and temperature changes. The dystrophic stage occurs three to six months after the development of the disorder. The symptoms of this stage are constant pain, affected limb feels coll and looks bluish, and early bone loss. During the final stage, called atrophic, the skin becomes cool and shiny, increased muscle stiffness and weakness occur, and symptoms may spread to another limb. The goal of the treatment of RSD is pain control and as much mobilization of the affected limb as possible. Treatment plans usually include physical therapy, medications, nerve blocks, and psychological support. Pain Management Associates is uniquely qualified to care for this pain disorder. Aggressive treatment is indicated because the long-term consequences can be severely debilitating. Have your personal doctor contact Pain Management, Fort Wayne's premiere pain management facility, if you are suffering from RSD.